Ari's In Wonderland: Shiro Cosmetics Tinted Balms in "Who Swallowed A Star" and "A Girl and A Cat"
Shiro Cosmetics Tinted Balms in "Who Swallowed A Star" and "A Girl and A Cat"
I'm a self-proclaimed geek. I have always been, and I always will be. I geek over a lot of things, like books (both regular and graphic novels), video games, as well as Japanese animation shows [anime] and movies. Some of my most favorite Japanese animation movies were created and produced by the amazing Studio Ghibli. If you're not familiar with them, they made the popular and well-loved 魔女の宅急便 [Majo no Takkyūbin/Kiki's Delivery Service] and もののけ姫 [Princess Mononoke], amongst many others. With that, it's safe to say that beauty products with a theme that caters to any of my geeky interests are a must-have for me. Thank god for sites like Shiro Cosmetics who cater to people just like me! 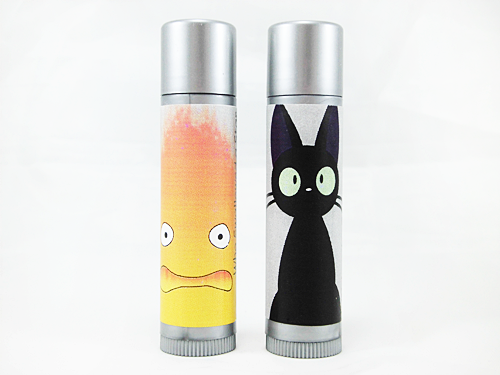 For my birthday last year, my boyfriend got me a bunch of items from there that included these super cute, tinted lip balms that are Studio Ghibli themed! From Shiro Cosmetics: "Our greatly improved balm formulation is ultra moisturizing, providing a sheer wash of color with a slick, lightly glossy finish. Flavored with delicious French Vanilla!" All their tinted balms come in a 0.15 oz plastic, silver tube. Like most balms, it's a twist-up product. They currently have five different kinds and all of them are Studio Ghibli themed. The whole collection is dubbed as the 'Miyazaki Tints', referring to Hayao Miyazaki, one of the co-founders of Studio Ghibli. You’d think they’d never seen a girl and a cat on a broom before… Deep purple in the tube, applies as a medium-sheer berry. A heart’s a heavy burden. Bright coral-orange in the tube, applies a bit pinker than you might expect! Will leave behind a light stain. Ingredients: coconut oil, candelilla wax, jojoba oil, carnauba wax, red #27, red #6, iron oxide, castor oil, tocopherol, flavor. I was a little surprised, but not entirely upset, at the condition of these brand new balms when I opened them. They had cracks all around and the red one looked like a chunk of it 'caved in'. I'm not sure though if they all really come like this or perhaps they got banged up a bit inside the box during transit, or even if the heat back home affected them somehow while the package was sitting in customs. Either way, it didn't affect the product's performance at all! From the swatches you can see that like many tinted balms, these are not entirely opaque but they still have a good amount of pigmentation. For the swatches, I swiped the product back and forth 2-3 times. True to what the website states, they do leave a slick and glossy finish. "Who Swallowed A Star" & "A Girl and A Cat"
Applying both balms is a breeze. They glide right on and are fairly moisturizing, though if you have very dry lips like mine you might need to prep your lips with a clear balm first, especially since these can highlight dry patches or flakes on your lips because the color will concentrate most around any of those. I actually recommend applying a clear balm beforehand, and even a lip primer if you have one, because the color can also easily highlight any deeper lines on your lips and settle into them after a while. A clear balm and/or primer can act as a 'barrier' to prevent that. Wear time is the biggest difference between them both. "A Girl and A Cat" isn't very long-lasting, so expect to re-apply it entirely after eating. It'll remain mostly intact if you're just say, having a drink, but with the use of a straw. It also doesn't fade or disappear evenly most of the time, leaving patches of color here and there so a full re-application is best. 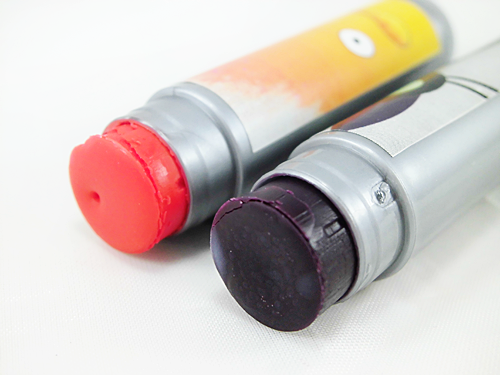 Since the formula of these balms is very slick, they do kind of slip and slide on the lips and transfer very easily. 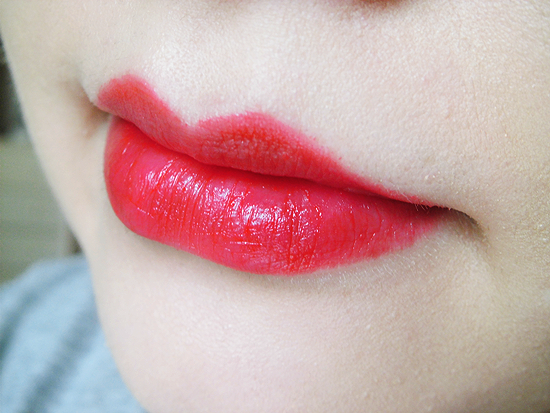 "Who Swallowed A Star" has the same wear time but it thankfully leaves behind a visible tint, so even if it's technically disappeared from your lips, they'll still be left with a nice, coral-red shade on them. Like I mentioned though, color from these balms can settle into any lines you have in your lips, even the fine ones, and it'll be more obvious once most of the balm has faded so it's best to re-apply your clear balm or primer again then re-apply this tinted one. However, re-applying just the tinted balm will suffice and the highlighted lines won't look as noticeable anymore. Overall, despite not being the biggest fan of how slippery the formula of these balms are, I still like them. Out of the two, 'Who Swallowed A Star' is definitely my favorite for both the color and the longer wear time, as well as the tint it leaves. I reach for these quite often when I'm either having a 'low key makeup' kind of day, or when my lips are just a tad bit too dry for ordinary lipsticks. Will I re-purchase? Maybe! I am intrigued by the other shades being offered, like "With Eyes Unclouded" which is a sheer red balm with a brown undertone, and "Come Out, Come Out" which is more of an apricot color. 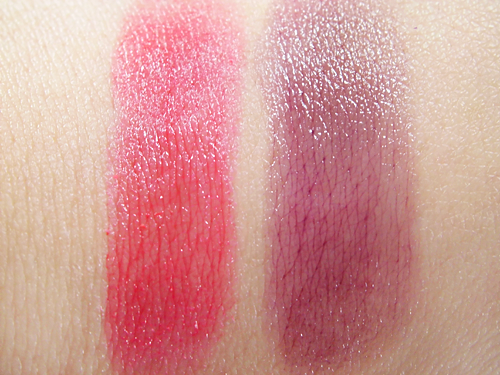 For now though, I'll try and hunt down other tinted balms that boast a longer wear time and more shades. If you're both a beauty product junkie and Studio Ghibli (or Japanese animation) geek like myself however, do check these out and give them a try!